M2HNursing is a portal to various electronic nursing resources that Professor Hansen has developed while teaching at USF. How Do I Register For The Message Board, rr The Sample Online Quizzes? On the first day of class, Professor Hansen will hand out sheets of paper that detail the registration process. If you follow those instructions exactly as supplied you should not have any problems accessing the online curriculum. Ok, I am Having Problems Logging Into The Message Board! 2) When the login page loads, please enter your username and password, and click "Login"
3) You should now be logged in. The course you are enrolled in should now be listed on the main forum index page. If you continue to have problems, please e-mail Professor Hansen at: mmhansen@usfca.edu with a specific error message, and a detailed outline of the exact problem you are experiencing. 2) If you cannot find that e-mail please e-mail Professor Hansen at: mmhansen@usfca.edu and ask for a password reset. 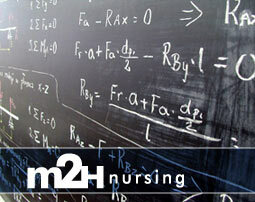 How do I get to M2HNursing? M2HNursing can be easily accessed by visiting: http://www.M2HNursing.com. The course you are currently enrolled in can be accessed from the menu on the left. How do I complete these tutorials for credit? When you are starting or ending a tutorial please be on the lookout for a link that says: "I am completing this tutorial for credit". When you follow this link you will be asked for your First Name, Last Name and USF ID #. Please enter ALL of this information. If you do not enter all of the information you will not receive credit for that activity. When you click submit your information will be stored in a database that will be accessed to formulate your grade at the end of the term. What is appropriate behavior in an online class - or online ? As in any class, you should behave with respect toward your classmates and your instructor. All conduct and disciplinary guidelines including such matters as plagiarism and cheating are taken seriously in an online class. In addition, taking an online class presents new challenges and new situations. Please review the guide below for appropriate "netiquette" (or online etiquette) before you begin your class. When can I access the M2HNursing website? Because you can connect to your online course via the Internet, it is available 7 days a week/24 hours per day while the course is in session. You may login to the message board, and sample online quizzes wherever you may have a reliable Internet connection. What are the minimum computer requirements for using M2HNursing? * Install anti-virus software such Norton Anti Virus [http://www.symantec.com/downloads/] or McAffe [http://us.mcafee.com/] on your computer is also recommended. You can download the software for your personal computer free at the University ITS site: http://www.usfca.edu/its/. * Download and install Java 1.4.2 (http://www.java.com). * Disable any "pop-up blocker" software that you have installed on your computer. * Set your screen resolution at 1024 x 768 pixels, for optimum viewing.